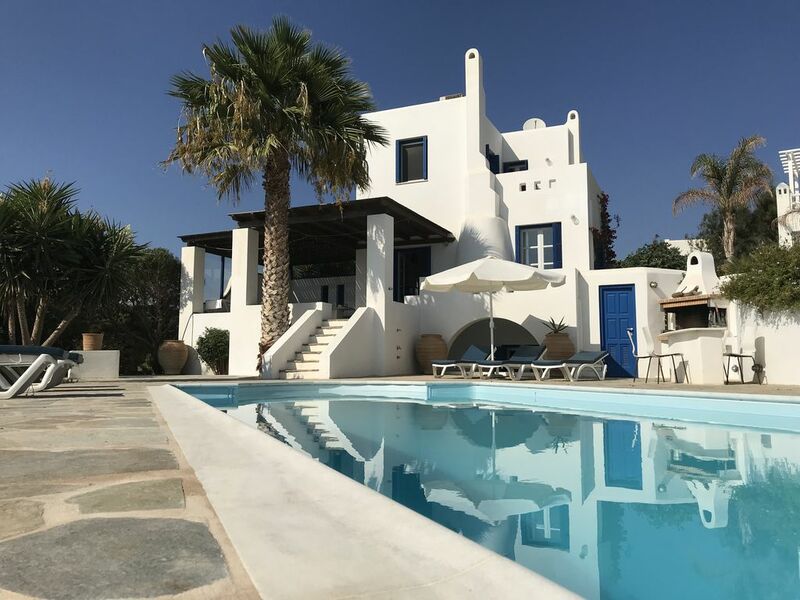 Beautiful 3 bedroom, 2 bathroom villa with a private pool with stunning views on the Cycladic island of Naxos. With outside patios for al fresco dining, the Villa is located 100 metres from the beach. This is a detached house registered by the National Tourist Organisation under license MHTE 1174K91001075301. The Greek Tax authority now demand that we take a passport Number, Nationality and an Address of our guests when we accept a booking. (Like hotels do in all European countries- We are required to make a tax return every month - on line to the Greek Tax Office). It is set in its own grounds and is surrounded by farm land, providing a peaceful and safe environment for families and children. The ground floor consists of an open plan kitchen/lounge area with direct access to the patio, with a staircase down to 2 bedrooms and one bathroom. The upstairs area is the feature area of the villa with an en suite bedroom leading onto a balcony with wonderful views of the ocean. The property is fully furnished and equipped with all the luxuries required for a relaxing holiday, including a fully fitted kitchen, dishwasher and a washing machine, couches and sun loungers. Overview: This villa was completed on the 31st March 2008. The 40 sq metre pool has been designed and constructed with children in mind. There are solid steps into the pool with seats both sides in the water. The BBQ area next to the pool ensures a perfect evening round the pool while the large outside covered terrace compliments the whole ambience. Sea Views: The villa has wonderful sea views from every window and every balcony which also lead your eye back to the glittering pool in the day and night when the lights in and around the pool remind you that you are in paradise. A short step to the end of the villas property will lead you on to the beach via the natural fresh water lake where flamingos have been seen to stop on their journey south. Bird watchers will love the varied species to be seen around the lake. The beach is clean, fresh and unspoiled. You feel that you are the first person to visit it every time you go. History and Activities: Naturally there are many temples to be explored, some only recently found...Naxos is known for its white marble and the production of emery, which allows the visitor further opportunities to explore. Naxos offers horse riding, walking trails and cycling opportunities.. Even Paros, the island seen from almost every window in the villa, had its famous pirate who regularly raided Naxos for slaves, etc..
My wife, Susan and I live in the countryside of Somerset in England. We have been married for 42 years and have 3 grown up children and four grandchildren. We came to Greece to find our own piece of paradise, a villa by the sea with Olive trees and a pool. We chose a well known local Architect who created our dream home 100 metres from the beach with an uninterrupted view of the blue Aegean Sea. We accept that many people smoke but we would prefer that any smoking is restricted to outside. Really nice villa 3mins to beach. Very quiet area. Con: other villas over look pool. Great property in a really great part of Naxos. We had a fabulous time. Thank you for the review. Yes it is very quiet and we love it just as you have done. Wonderful villa right by the sea. Great pool. Very relaxing. Lovely villa within walking distance of the sea. Plenty of sandy beaches and coves nearby. Taverna within walking distance and right on the beach. Great location. So you, too, have discovered our paradise...we love it and we love the fact that you agree. We are so pleased you enjoyed our villa. We also think it is perfect. We spent 2 weeks of our honeymoon in this beautiful villa by the beach. The villa itself was perfect for us in every way. The grounds and pool were extremely well maintained, with a (very nice) contractor coming a couple of times a week to vacuum the pool and ensure all was in order. The villa was equipped with everything we needed to feel that it was our home. The weather was 28-30C every day with clear cloudless skies. We spent our days lazing by the pool, walking to the beach (a short walk) for a swim, and doing a little bit of touring. We were provided with maps and suggestions for restaurants, shops and local attractions. We enjoyed many local restaurants, but our favorite was Apolofsi, which is only a few hundred metres up the road. We would recommend it highly. Although the restaurants all had wine lists, we enjoyed the "barrel wines" that are made onsite. The A/C in our room kept us cool at night. We had to pinch ourselves to make sure this wasn't just a dream. Riet, the property manager, met us at the boat and ensured that we had everything that we needed. If you are looking for a beautiful villa with all the conveniences of home, outstanding views, a great pool and private sitting area located close to the beach, then this could be the place for you. We will be recommending it to any friends going to Greece! We are so pleased that your stay was so wonderful. It is just what we want to hear about our own little paradise in Naxos which we think is so perfect..
Great island and place to stay! We spent 1 week at this villa and enjoyed it. There were 6 of us (4 adults, 2 children) so a little cramped but still a nice and clean villa. Was close to a few restaurants that are open year round and a nice beach within walking distance. Definitely need a car because there are lots of places to go on Naxos. Sehr schönes Haus in ruhiger Lage, wunderschön in Strandnähe, sehr gepflegter schöner Pool. Wir haben uns sehr wohl gefühlt! Lediglich die Sauberkeit war Nachbesserungsbedürftig! Vielen Dank für Ihren Besuch in Griechenland, leider haben Sie bei der Ankunft in der Villa Staub und Sand vorgefunden. Ich wusste das Sie sich 2 Tage verspaeten werden und in Athen aufhalten wurden da viele Flüge, Fähren etc wegen des Sturms und des schrecklichen Wetters storniert wurden. Die Villa, die nahe am Meer gelegen ist, wurde leider auch von diesem schrecklichen Sturm getroffen. Die Villa wurde von innen und außen gereinigt, bevor Sie ankamen, aber jeder, der das schon Mal erlebt hat, weiß, dass Staub in der Luft bleibt und sich für mehrere Tage überall ablagert. Leider waren auch Sie bei Ihrer Ankunft davon betroffen. I know that you found dust in the villa on arrival...I also know that you were delayed for two days in Athens because of a dust storm and terrible weather(All Ferries and Flights were cancelled). The villa, being so close to the sea, was hit by this terrible storm. The villa was cleaned both inside and outside before you arrived...however anyone who has experienced this will know that dust stays in the air and deposits the dust for several days...this is what you found when you arrived...........Over the last eleven years we have never had a complaint of this kind. In the South-West part of Naxos Island, at 17km from the town centre (Chora) in Kastraki, there are endless beaches, probably the most enchanting in the Mediterranean. Sandy beaches spreading over kilometres and crystal-clear sea waters make this area ideal for those who long for relaxing days in a quiet place, away from overcrowded summer resorts. A 40 m2 private pool which is 65 metres from the sea. 50% of rental amount payable on booking, other 50% payable thirty days before the date of arrival.